I drove past a garden this week white with Sevin dust or some other noxious agri-chemical pesticide. A pity, I thought. Just that morning I had stood in the garden near a tiny drama like the one you see here (image from 2002) imagining how much better off we’d often be to leave natural systems alone and purge our poisons from the garden shed. That gardener’s insect poison dust sure enough killed some harmful veggie-munchers, but it also disrupted a biological system that is amazingly fine-tuned to get rid of those same caterpillars that might have provoked him one morning to kill every living creature in his garden and garden soil. He could have enjoyed the environmental services of the parasitoid braconid wasp and reduced the chemical risk to his ground water, neighborhood and family. 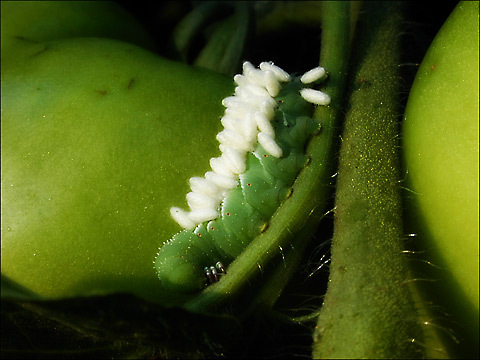 If you see this combination of large green caterpillar and white cottony cocoons, don’t pull it from the tomato vine. Leave it in place. Each white cocoon contains a larva that will produce another tiny wasp that will fly off and find another big green caterpillar to lay its eggs in. Bon appetit! This is a system finely targeted, and without the massive collateral damage to earthworms, honeybees and people. And I only this morning in my browsing learned there’s a virus I’d never heard of that is specially tailored over the millenia to play a part in this amazing wasp life cycle happening right out in my garden and yours this very minute! I’ll include two snips with links that tell you what I’m talking about. (Some braconid wasps) … display elaborate physiological adaptations to enhance larval survival within host, for example the co-option of endosymbiotic viruses for compromising host immune defenses. These polydnaviruses are often used by the wasps instead of a venom cocktail. These viruses are part of a unique biological system consisting of an endoparasitic wasp (parasitoid), an insect (usually lepidopteran) larva, and the virus. The full genome of the virus is integrated into the genome of the wasps and the virus only replicates in specific cells in the female wasp’s reproductive system.The virus is injected along with the wasp egg into the body cavity of a lepidopteran host caterpillar and infects cells of the caterpillar. The infection does not lead to replication of new viruses, rather it affects the caterpillar’s immune system. Without the virus infection, phagocytic hemocytes (blood cells) will encapsulate and kill the wasp egg but the immune suppression caused by the virus allows for survival of the wasp egg, leading to hatching and complete development of the immature wasp in the caterpillar. Additionally, genes expressed from the polydnavirus in the parasitised host alter host development and metabolism to be beneficial for the growth and survival of the parasitoid larva. Thus, the virus and wasp have a symbiotic (mutualistic) relationship. So the next time you think about the Bigger Hammer approach to pest control inside the garden fence, remember there might be more lost than gained when you pull the trigger. I couldn’t convince Bonnie of this. We Bigger Hammered the yellow jackets. We don’t always practice what we preach. I found this information fun and fascinating. Thanks! Nature has always had checks and balances. It’s when we disrupt the system by planting only one crop without beneficial crops or insects or trying to eradicate every moving creature that we run into problems. Appreciate the description of how this works! In my book, the value of a garden is in the absence of the “big hamer.” My bed of kale is being stressed at the moment by big ol’ bugs that I don’t recognize. I could research it, etc, but I think I’ll just keep watering it and let it be. The kale wouldn’t be at top flavor in this heat anyway. When the weather cools and the bugs are done in, the kale will bounce back with new growth and a sweeter flavor–for months into the cold weather. In the meantime, the chard is really good. Every summer the wasps/mud-daubers insist on building in every corner of our little front stoop. Likewise, the granddaddy longlegs. I tried the “big hammer” to no effect. They just move over 6″ and rebuild. Finally, I found the best/easiest/cheapest/healthiest solution is the power nozzle on the end of my garden hose every 3 or 4 weeks. Bonus is a clean stoop! I look forward to your blogs, bugs and all! Next Next post: What’s Blogging Worth?